← Giveaway: American Pops Orchestra Presents “A Very Silly Vaudeville” at Arena Stage! This past weekend, Owen and I caught a performance of Long Way Down at the Kennedy Center. 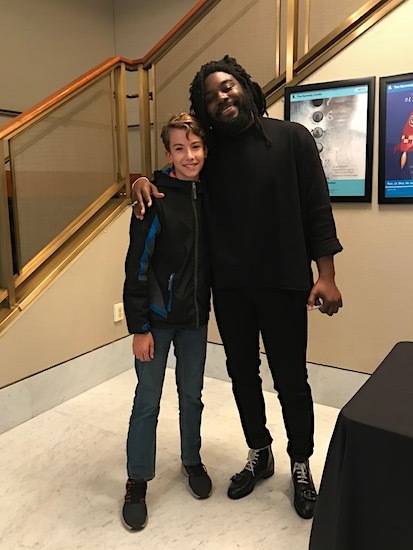 Based on the award winning novel by Jason Reynolds, the show presents the story of Will, a 15-year-old boy who is about to seek revenge for his older brother’s murder. Riding down the eight floors of his apartment building, his brother’s gun tucked in his waistband, Will at first is just thinking about The Rules: 1) No Crying 2) No Snitching 3) Get Revenge. That is, until he encounters a few people from his past on the way down. The characters who join Will in the elevator have died, each of them killed by gun violence at some point during Will’s life. But they return as the people they would be now — the age they would be and with a perspective of what happened to them. There is Uncle Buck, childhood friend Dani, Uncle Mark, his father, Buck’s killer Frick, and, finally, his brother, Shawn. One of the most amazing things about the show is that all of the characters are played by just one actor. Justin Weaks does a superb job bringing them all to life (literally, in a way). For over an hour, it was just him on stage, and he had us all mesmerized the entire time. As Will interacts with every person, and we learn more about each of their lives and deaths, we also get a peek inside Will’s mind — his grief, anger, frustration, heartache — as he contemplates all that has happened and what he is about to do. He begins to question his intent to follow The Rules. And as the elevator doors finally open, and Shawn asks, “You coming?” it’s almost as if there’s a collective gasp as everyone in the audience holds their breath. Long Way Down is running at the Kennedy Center, with several shows remaining from Thursday 11/1 – Sunday, 11/4, and there are still some tickets available for just about all of them. His book and this production convey that brilliantly.